This last month we had the privilege of attending and showcasing at the Fashion Market Northern California in San Mateo. We met some great people, made lasting connections, wrote orders for some fantastic new stores and got to show more people the talent behind Our Hands for Hope. Read below to see the full article that was in the California Apparel News. SAN MATEO, Calif.—Business was steady and productive at Fashion Market Northern California, held June 23–25 at the San Mateo County Event Center.The regional trade show served as a showcase for returning and new brands, including several with a sustainable or philanthropic message, according to FMNC Executive Director Suzanne De Groot. June markets, which typically showcase Holiday merchandise, tend to be smaller but bring in loyal buyers looking for Immediate deliveries and necessity goods. Don Reichman, an exhibitor at FMNC, said this is an important market particularly because it falls between the large LA shows in March for Fall and in October for Spring. Reichman is treasurer of the Golden Gate Apparel Association (GGAA), which organizes the FMNC show. Northern California stores can come to the June FMNC show to fill in orders for Holiday. Retailers from Northern California, Oregon, Washington and Colorado came to the show, particularly because it is easy to shop, he said. Napa Valley, Calif.–based retailer Barbara Wiggins of Mustard Seed described FMNC as more convenient for her than other markets. “I love this show. You can find it all, and everyone is so nice. I am shopping for an annual fashion-show fundraiser for Queen of the Valley Medical Center and looking to find pieces specifically for the event, knowing I will find it all here,” Wiggins said. Steve Alpert, president of GGAA, said when he asks retailers why they attend the show, feedback is always consistent. “It is the friendliest show to attend, and that has become a theme for us,” he said, crediting the open-booth format and the quality of vendors. “Exhibitors know not to push buyers, so retailers are treated with respect,” Alpert said. Returning exhibitor Gabriela Shultz of Adorn Thyself showroom in San Francisco said although the first two days were steady, the last day of the show typically was “jamming.” Shultz carries brands such as American Colors, a collection of tunic shirts in a range of fabrications that wholesale for $79–$95. Myrrhia Resneck, owner of Myrrhia Fine Knitwear, was a first-time FMNC exhibitor who released her collection in February 2012. Her merchandise—which ranges from sweaters to cardigans, scarves, dresses and tops—comes in merino wool, organic California-grown cotton and Tencel. Wholesale price points for accessories start at $20 and go up to $40 while garments range from $60 to $130. “I would love for my designs to speak for themselves, but [being eco-friendly] is a part of my own concern,” Resneck said. “I want to produce apparel in a sustainable and ethical manner.” Resneck said she wants to make clothes that help women succeed in their professional careers while helping them still express their individuality and not be in some kind of uniform. Several exhibitors at FMNC were showing hand-crafted apparel and accessories from companies with a humanitarian mission. 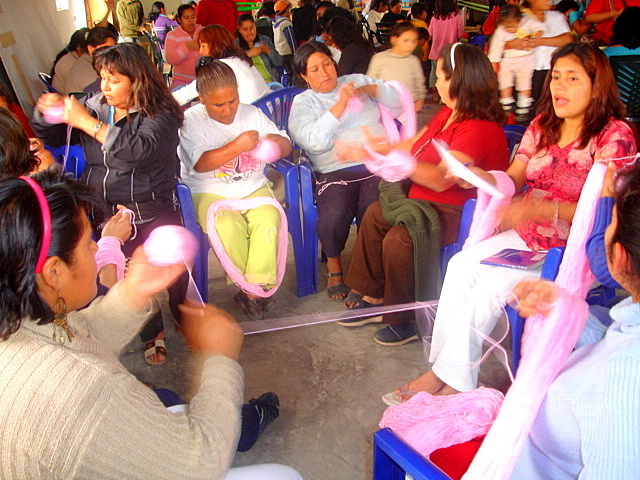 Napa Valley–based apparel company Our Hands for Hope produces apparel and accessories hand-knit in Peru. Founded by Terisa Brooks-Huddleston, the company was created in partnership with two non-governmental organizations (NGOs), Creation Peru and New Hope International, according to Cinthya Rubio, Our Hands for Hope’s marketing specialist. While Huddleston is responsible for 90 percent of the design process, it is a collaboration between the designer and the knitters. All of the pieces are named after the Peruvian women. The company currently employs 60 people in Peru but is expanding. Each piece is made from Alpaca with some wool and acrylic blends to keep the shape of the item. Large blankets can wholesale up to $174 while a headband wholesales for much lower. Our Hands for Hope primarily retails to local specialty boutiques but recently landed an order with the Denver International Airport. “We pulled a lot people in here at market because they are attracted to our [brand] story,” Rubio said. Sasa Designs jewelry is produced by a team of deaf artisans in Kenya under the direction of a nonprofit organization that invests its profits into services for the deaf. Sasa provides training, administration and a workshop where the jewelry makers can work independently. Wholesale price points for the delicately beaded necklaces and bracelets range between $4 and $20. Partners Cynthia Carle and Elaine Aronson of Oofkas make cuffs to accessorize a jacket or an outfit. A portion of their sales goes to Girls Learn International, an organization that encourages education around the world, including India, Pakistan and Africa. The Los Angeles–based company offers three styles, ranging from basic denim and gray to flashier versions, wholesale priced from $12.50 to $19.50. Carle and Aronson showed their line at the MAGIC trade show in Las Vegas earlier this year but said it was too overwhelming. “This [show] is much smaller and very friendly,” Carle said. Do you ever walk into a clothing store and wonder where your new blouse really came from? The tag may usually say from China, but who was the person creating it and ensuring every stitch and seam met up perfectly for you to wear? 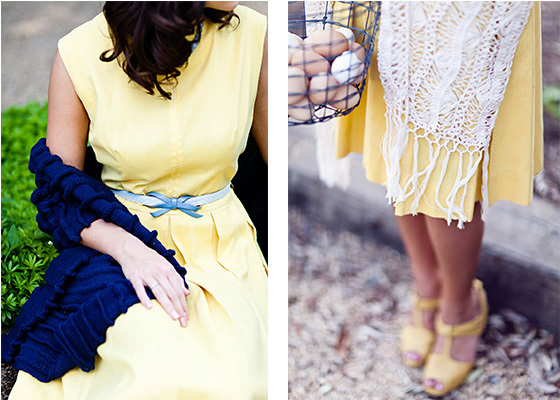 At Our Hands for Hope, we’re on a mission – A mission for fashion, a mission for prosperity, and a mission for hope. We’re not just about the knits, but the people behind them. We believe in the power of helping others and how far that power can take us. For the past three years, we’ve been working with some wonderful women in Peru to showcase their skill in alpaca knitwear, bringing trendy pieces to you and hope to them. These women are mothers, caretakers, and harbor a great skill. We’ve stepping in to create a sustainable, trendy product line that showcases their incredible talents and introduces them to the United States market, providing them and their families with opportunities not easily accessible outside of Western outlets. Our home originated in the Napa Valley, but we’ve been expanding. We are now in California, Texas, and Colorado, and are looking to spread hope to new markets, telling our story to encourage women not only in Peru but the rest of the world. So, here we are: Our Hands for Hope. We are diving into the fashion world with a purpose. This blog is our place to show you our travels, thoughts, and trends and to inspire you to lend a hand to the hopeful. Together, we are changing lives one knit at a time.